The work on our wonderful 1.25 acre garden has been continuing throughout Spring. The list of jobs is pretty extensive! Digging out brambles and weeds, trimming the box hedging, making our raised beds in the footprint of the old Carnation House, building the Mud Kitchen, sowing the wildflowers, laying the bark chippings in our climbing log area (see picture - more logs from the surrounding woodland to come! ), rotavating the mini-allotments and many more! 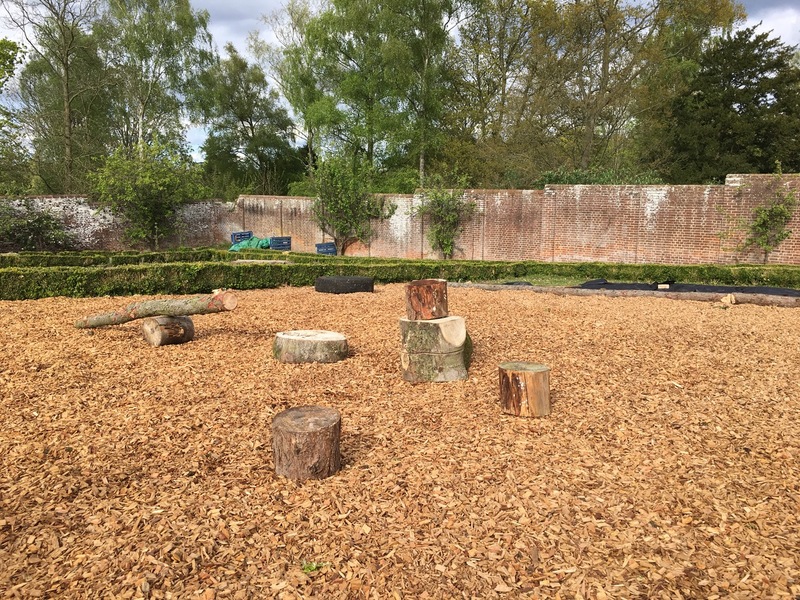 The jobs for May include installing the outside toilets, building the Yurt classroom with woodburner, creating the earth mound with hidey-hole and slide, planting in the raised beds and keeping on top of the weeds! It's been lovely to see the Herons flying over, there is a large Heronry down in the adjacent woods, as well as the circling Buzzards - such a haven for wildlife. We will post more pictures soon.